1 The loving-kindnesses of Jehovah will I sing for ever, To generation after generation will I make known Thy Faithfulness with my mouth. 4 For ever will I establish thy seed, And build up thy throne to generation after generation. Selah. 5 And the heavens shall make known Thy wonders, Jehovah, Thy Faithfulness also in the congregation of Thy holy ones. 6 For who in the skies can be set beside Jehovah, [Or] likened to Jehovah, amongst the sons of the mighty ones? 7 A God very terrible in the council of the holy ones, And dread above all round about Him. 8 Jehovah, God of Hosts, who like Thee is mighty, Jah? And Thy Faithfulness [is] round Thee. 9 Thou, Thou rulest the insolence of the sea, When its waves lift themselves on high, Thou, Thou stillest them. 10 Thou, Thou hast crushed Rahab as one that is slain, By the arm of Thy strength Thou hast scattered Thine enemies. 11 Thine are the heavens, Thine also the earth, The world and its fulness, Thou, Thou hast founded them. 12 North and south, Thou, Thou hast created them, Tabor and Hermon shout for joy at Thy Name. 13 Thine is an arm with might, Strong is Thy hand, high is Thy right hand. 14 Righteousness and Justice are the foundation of Thy throne, Loving-kindness and Troth go to meet Thy face. 15 Blessed the people who know the festal shout! Jehovah, in the light of Thy face they walk. 16 In Thy Name do they exult all the day, And in Thy righteousness are they exalted. 17 For the glory of their strength art Thou, And in Thy favour shall our horn be exalted. 18 For to Jehovah [belongs] our shield, And to the Holy One of Israel our king. 22 No enemy shall steal upon him, And no son of wickedness shall afflict him. 24 And My Faithfulness and My Loving-kindness [shall be] with him, And in My name shall his horn be exalted. 25 And I will set his hand on the sea, And his right hand on the rivers. 26 He, he shall call upon Me, My Father art Thou, My God and the rock of my salvation. 27 Also I, I will give him [to be My] first-born, Higher than the kings of the earth. 28 For ever will I keep for him My Loving-kindness, And My covenant shall be inviolable towards him. 29 And I will make his seed [to last] for ever, And his throne as the days of heaven. 32 Then will I visit their transgression with a rod, And their iniquity with stripes. 33 But My Loving-kindness will I not break off from him, And I will not be false to My Faithfulness. 34 I will not profane My covenant, And that which has gone forth from My lips will I not change. 35 Once have I sworn by My holiness, Verily I will not be false to David. 37 As the moon shall he be established for ever, And the witness in the sky is true. Selah. 39 Thou hast abhorred the covenant of Thy servant, Thou hast profaned his crown to the ground. 40 Thou hast broken down all his fences, Thou hast made his strongholds a ruin. 41 All that pass on the way spoil him, He is become a reproach to his neighbours. 42 Thou hast exalted the hand of his adversaries, Thou hast made all his enemies rejoice. 43 Also Thou turnest the edge of his sword, And hast not made him to stand in the battle. 45 Thou hast shortened the days of his youth, Thou hast wrapped shame upon him. Selah. 46 How long, Jehovah, wilt Thou hide Thyself for ever? [How long] shall Thy wrath burn like fire? 47 Remember how short a time I [have to live], For what vanity hast Thou created all the sons of men! 48 Who is the man who shall live and not see death, [Who] shall deliver his soul from the hand of Sheol? 49 Where are Thy former loving-kindnesses, Jehovah, Which Thou swarest to David in Thy faithfulness? 51 Wherewith Thine enemies have reproached Thee, Jehovah, Wherewith they have reproached the footsteps of Thine anointed. 52 Blessed be Jehovah for evermore. Amen and Amen. The foundation of this psalm is the promise in 2 Sam. vii. which guaranteed the perpetuity of the Davidic kingdom. Many of the characteristic phrases of the prophecy recur here--e.g. , the promises that the children of wickedness shall not afflict, and that the transgressions of David's descendants should be followed by chastisement only, not by rejection. The contents of Nathan's oracle are first given in brief in vv. 3, 4--"like a text," as Hupfeld says--and again in detail and with poetic embellishments in vv. 19-37. But these glorious promises are set in sharpest contrast with a doleful present, which seems to contradict them. They not only embitter it, but they bewilder faith, and the psalmist's lament is made almost a reproach of God, whose faithfulness seems imperilled by the disasters which had fallen on the monarchy and on Israel. The complaint and petitions of the latter part are the true burden of the psalm, to which the celebration of Divine attributes in vv. 1-18, and the expansion of the fundamental promise in vv. 19-37, are meant to lead up. The attributes specified are those of Faithfulness (vv. 1, 2, 5, 8, 14) and of Power, which render the fulfilment of God's promises certain. By such contemplations the psalmist would fortify himself against the whispers of doubt, which were beginning to make themselves heard in his mind, and would find in the character of God both assurance that His promise shall not fail, and a powerful plea for his prayer that it may not fail. The whole tone of the psalm suggests that it was written when the kingdom was toppling to ruin, or perhaps even after its fall. Delitzsch improbably supposes that the young king, whom loss and shame make an old man (ver. 45), is Rehoboam, and that the disasters which gave occasion to the psalm were those inflicted by the Egyptian king Shishak. Others see in that youthful prince Jehoiachin, who reigned for three months, and was then deposed by Nebuchadnezzar, and whom Jeremiah has bewailed (xxii. 24-29). But all such conjectures are precarious. The structure of the psalm can scarcely be called strophical. There are three well-marked turns in the flow of thought,--first, the hymn to the Divine attributes (vv. 1-18); second, the expansion of the promise, which is the basis of the monarchy (vv. 19-37); and, finally, the lament and prayer, in view of present afflictions, that God would be true to His attributes and promises (vv. 38-51). For the most part the verses are grouped in pairs, which are occasionally lengthened into triplets. The psalmist begins with announcing the theme of his song--the Loving-kindness and Faithfulness of God. Surrounded by disasters, which seem in violent contradiction to God's promise to David, he falls back on thoughts of the Mercy which gave it and the Faithfulness which will surely accomplish it. The resolve to celebrate these in such circumstances argues a faith victorious over doubts, and putting forth energetic efforts to maintain itself. This bird can sing in midwinter. True, the song has other notes than joyous ones, but they, too, extol God's Loving-kindness and Faithfulness, even while they seem to question them. Self-command, which insists on a man's averting his thoughts from a gloomy outward present to gaze on God's loving purpose and unalterable veracity, is no small part of practical religion. The psalmist will sing, because he said that these two attributes were ever in operation, and lasting as the heavens. "Loving-kindness snail be built up for ever," its various manifestations being conceived as each being a stone in the stately building which is in continual course of progress through all ages, and can never be completed, since fresh stones will continually be laid, as long as God lives and pours forth His blessings. Much less can it ever fall into ruin, as impatient sense would persuade the psalmist that it is doing in his day. The parallel declaration as to God's Faithfulness takes the heavens as the type of duration and immobility, and conceives that attribute to be eternal and fixed, as they are. These convictions could not burn in the psalmist's heart without forcing him to speak. Lover, poet, and devout man, in their several ways, feel the same necessity of utterance. Not every Christian can "sing," but all can and should speak. They will, if their faith is strong. The Divine promise, on which the Davidic throne rests, is summed up in the abruptly introduced pair of verses (3, 4). 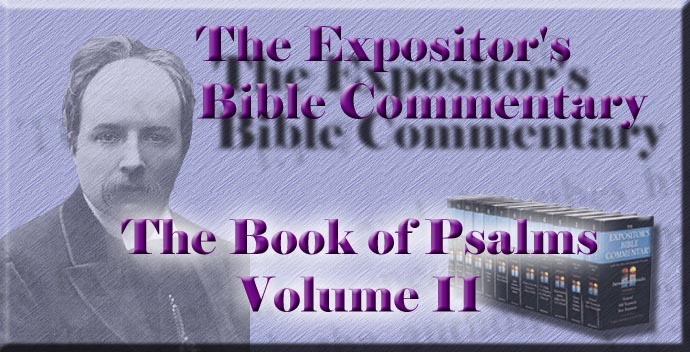 That promise is the second theme of the psalm; and just as, in some great musical composition, the overture sounds for the first time phrases which are to be recurrent and elaborated in the sequel, so, in the four first verses of the psalm, its ruling thoughts are briefly put. Vv. 1, 2, stand first, but are second in time to vv. 3, 4. God's oracle preceded the singer's praise. The language of these two verses echoes the original passage in 2 Sam. vii., as in "David My servant, establish, for ever, build," the last three of which expressions were used in ver. 2, with a view to their recurrence in ver. 4. The music keeps before the mind the perpetual duration of David's throne. In vv. 6-18 the psalmist sets forth the Power and Faithfulness of God, which insure the fulfilment of His promises. He is the incomparably great and terrible God, who subdues the mightiest forces of nature and tames the proudest nations (vv. 9, 10), who is Maker and Lord of the world (vv. 11, 12), who rules with power, but also with righteousness, faithfulness, and grace (vv. 13, 14), and who, therefore, makes His people blessed and safe (vv. 15-18). Since God is such a God, His promise cannot remain unfulfilled. Power and willingness to execute it to the last tittle are witnessed by heaven and earth, by history and experience. Dark as the present may be, it would, therefore, be folly to doubt for a moment. The psalmist begins his contemplations of the glory of the Divine nature with figuring the very heavens as vocal with His praise. Not only the object but the givers of that praise are noteworthy. The heavens are personified, as in Psalm xix. ; and from their silent depths comes music. There is One higher, mightier, older, more unperturbed, pure, and enduring than they, whom they extol by their lustre which they owe to Him. They praise God's "wonder" (which here means, not so much His marvellous acts, as the wonderfulness of His Being, His incomparable greatness and power), and His Faithfulness, the two guarantees of the fulfilment of His promises. Nor are the visible heavens His only praisers. The holy ones, sons of the mighty--i.e., the angels--bow before Him who is high above their holiness and might, and own Him for God alone. With ver. 9 the hymn descends to earth, and magnifies God's Power and Faithfulness as manifested there. The sea is, as always, the emblem of rebellious tumult. Its insolence is calmed by Him. And the proudest of the nations, such as Rahab ("Pride," a current name for Egypt), had cause to own His power, when He brought the waves of the sea over her hosts, thus in one act exemplifying His sovereign sway over both nature and nations. He is Maker, and therefore Lord, of heaven and earth. In all quarters of the world His creative hand is manifest, and His praise sounds. Tabor and Hermon may stand, as the parallelism requires, for west and east, though some suppose that they are simply named as conspicuous summits. They "shout for joy at Thy Name," an expression like that used in ver. 16, in reference to Israel. The poet thinks of the softly swelling Tabor with its verdure, and of the lofty Hermon with its snows, as sharing in that gladness, and praising Him to whom they owe their beauty and majesty. Creation vibrates with the same emotions which thrill the poet. The sum of all the preceding is gathered up in ver. 13, which magnifies the might of God's arm. But more blessed still for the psalmist, in the midst of national gloom, is the other thought of the moral character of God's rule. His throne is broad-based upon the sure foundation of righteousness and justice. The pair of attributes always closely connected--namely, Loving-kindness and Troth or Faithfulness--are here, as frequently, personified. They "go to meet Thy face"--that is, in order to present themselves before Him. "The two genii of the history of redemption (Psalm xliii. 3) stand before His countenance, like attendant maidens, waiting the slightest indication of His will" (Delitzsch). Since God is such a God, His Israel is blessed, whatever its present plight. So the psalmist closes the first part of his song, with rapturous celebration of the favoured nation's prerogatives. "The festal shout" or "the trumpet-blast" is probably the music at the festivals (Numb. xxiii. 21 and xxxi. 6), and "those who know" it means "those who are familiar with the worship of this great God." The elements of their blessedness are then unfolded. "They walk in the light of Thy face." Their outward life is passed in continual happy consciousness of the Divine presence, which becomes to them a source of gladness and guidance. "In Thy Name do they exult all the day." God's self-manifestation, and the knowledge of Him which arises therefrom, become the occasion of a calm, perpetual joy, which is secure from change, because its roots go deeper than the region where change works. "In Thy righteousness shall they be exalted." Through God's strict adherence to His covenant, not by any power of their own, shall they be lifted above foes and fears. "The glory of their strength art Thou." In themselves they are weak, but Thou, not any arm of flesh, art their strength, and by possession of Thee they are not only clothed with might, but resplendent with beauty. Human power is often unlovely; God-given strength is, like armour inlaid with gold, ornament as well as defence. "In Thy favour our horn shall be exalted." The psalmist identifies himself at last with the people, whose blessedness he has so glowingly celebrated. He could keep up the appearance of distinction no longer. "They" gives place to "we" unconsciously, as his heart swells with the joy which he paints. Depressed as he and his people are for the moment, he is sure that there is lifting up. The emblem of the lifted horn is common, as expressive of victory. The psalmist is confident of Israel's triumph, because he is certain that the nation, as represented by and, as it were, concentrated in its king, belongs to God, who will not lose what is His. The rendering of ver. 18 in the A.V. cannot be sustained. "Our shield" in the first clause is parallel with "our king" in the second, and the meaning of both clauses is that the king of Israel is God's, and therefore secure. That ownership rests on the promise to David, and on it in turn is rested the psalmist's confidence that Israel and its king are possessed of a charmed life, and shall be exalted, however now abject and despondent. The second part (vv. 19-37) draws out in detail, and at some points with heightened colouring, the fundamental prophecy by Nathan. It falls into two parts, of which the former (vv. 19-27) refers more especially to the promises given to David, and the second (vv. 28-37) to those relating to his descendants. In ver. 19 "vision" is quoted from 2 Sam. vii. 17; "then" points back to the period of giving the promise; "Thy favoured one," is possibly Nathan, but more probably David. The Masoretic reading, however, which is followed by many ancient versions, has the plural "favoured ones," which Delitzsch takes to mean Samuel and Nathan. "Help" means the help which, through the king, comes to his people, and especially, as appears from the use of the word "hero," aid in battle. But since the selection of David for the throne is the subject in hand, the emendation which reads for "help" crown recommends itself as probable. David's prowess, his humble origin, and his devotion to God's service are brought into view in vv. 19, 20, as explaining and magnifying the Divine choice. His dignity is all from God. Consequently, as the next pair of verses goes on to say, God's protecting hand will ever be with him, since He cannot set a man in any position and fail to supply the gifts needed for it. Whom He chooses He will protect. Sheltered behind that strong hand, the king will be safe from all assaults. The word rendered "steal upon" in ver. 22 is doubtful, and by some is taken to mean to exact, as a creditor does, but that gives a flat and incongruous turn to the promise. For ver. 22 b compare 2 Sam. vii. 10. Victory over all enemies is next promised in vv. 23-25, and is traced to the perpetual presence with the king of God's Faithfulness and Loving-kindness, the two attributes of which so much has been sung in the former part. The manifestation of God's character (i.e., His Name) will secure the exaltation of David's horn--i.e., the victorious exercise of his God-given strength. Therefore a wide extension of his kingdom is promised in ver. 25, from the Mediterranean to the Euphrates and its canals, on which God will lay the king's hand--i.e., will put them in his possession. From ver. 28 onwards the psalmist turns to expand the promises to David's line. His words are mainly a poetical paraphrase of 2 Sam. vii. 14. Transgression shall indeed be visited with chastisement, which the fatherly relation requires, as the original passage indicates by the juxtaposition of the promise "I will be his Father," and the declaration "I will chasten him." But it will be chastisement only, and not rejection. The unchangeableness of God's loving purpose is very strongly and beautifully put in ver. 33, in which the twin attributes of Loving-kindness and Faithfulness are again blended as the ground of sinful men's hope. The word rendered above "break off" occasions a difficulty, both in regard to its form and its appropriateness in this connection. The clause is a quotation from 2 Sam. vii. 15, and the emendation which substitutes for break off the more natural word used there--namely, withdraw--is to be preferred. In ver. 33 b the paradoxical expression of being false to My faithfulness suggests the contradiction inherent in the very thought that He can break His plighted word. The same idea is again put in striking form in ver. 34: "I will not profane My covenant," even though degenerate sons of David "profane" God's statute. His word, once spoken, is inviolable. He is bound by His oath. He has given His holiness as the pledge of His word, and, till that holiness wanes, those utterances which He has sealed with it cannot be recalled. The certainty that sin does not alter God's promise is not traced here to His placableness, but to His immutable nature, and to the obligations under which He is laid by His own word and acts. That unchangeableness is a rock-foundation, on which sinful men may build their certitude. It is much to know that they cannot sin away God's mercy nor exhaust His gentle long-suffering. It is even more to know that His holiness guarantees that they cannot sin away His promises, nor by any breach of His commandments provoke Him to break His covenant. The allusions to the ancient promise are completed in vv. 36, 37, with the thought of the perpetual continuance of the Davidic line and kingdom, expressed by the familiar comparison of its duration to that of the sun and moon. Ver. 37 b is best understood as above. Some take the faithful witness to be the moon; others the rainbow, and render, as in the A.V. and R.V., "and as the faithful witness." But the designation of the moon as a witness is unexampled and almost unintelligible. It is better to take the clause as independent, and to suppose that Jehovah is His own witness, and that the psalmist here speaks in his own person, the quotation of the promises being ended. Cheyne encloses the clause in a parenthesis and compares Rev. iii. 14. The third part begins with ver. 38, and consists of two portions, in the first of which the psalmist complains with extraordinary boldness of remonstrance, and describes the contrast between these lofty promises and the sad reality (vv. 38-45), and, in the second prays for the removal of the contradiction of God's promise by Israel's affliction, and bases this petition on the double ground of the shortness of life, and the dishonour done to His own Name thereby. The expostulation very nearly crosses the boundary of reverent remonstrance, when it charges God with having Himself "abhorred" or, according to another rendering, "made void" His covenant, and cast the king's crown to the ground. The devastation of the kingdom is described, in vv. 40, 41, in language borrowed from Psalm lxxx. 12. The pronouns grammatically refer to the king, but the ideas of the land and the monarch are blended. The next pair of verses (42, 43) ventures still further in remonstrance, by charging God with taking the side of Israel's enemies and actively intervening to procure its defeat. The last verse-pair of this part (44, 45) speaks more exclusively of the king, or perhaps of the monarchy. The language, especially in ver. 45 a, seems most naturally understood of an individual. Delitzsch takes such to be its application, and supposes it to describe the king as having been prematurely aged by calamity; while Hupfeld, with Hengstenberg and others, prefer to regard the expression as lamenting that the early days of the monarchy's vigour had so soon been succeeded by decrepitude like that of age. That family, which had been promised perpetual duration and dominion, has lost its lustre, and is like a dying lamp. That throne has fallen to the ground, which God had promised should stand for ever. Senile weakness has stricken the monarchy, and disaster, which makes it an object of contempt, wraps it like a garment, instead of the royal robe. A long, sad wail of the music fixes the picture on the mind of the hearer. Then follows prayer, which shows how consistent with true reverence and humble dependence is the outspoken vigour of the preceding remonstrance. The boldest thoughts about the apparent contradiction of God's words and deeds are not too bold, if spoken straight to Him, and not muttered against Him, and if they lead the speaker to prayer for the removal of the anomaly. In ver. 46 there is a quotation from Psalm lxxix. 5. The question "How long" is the more imploring because life is so short. There is but a little while during which it is possible for God to manifest Himself as full of Loving-kindness and Faithfulness. The psalmist lets his feelings of longing to see for himself the manifestation of these attributes peep forth for a moment, in that pathetic sudden emergence of "I" instead of "we" or "men," in ver. 47 a. His language is somewhat obscure, but the sense is clear. Literally, the words read "Remember--I, what a transitoriness." The meaning is plain enough, when it is observed that, as Perowne rightly says, "I" is placed first for the sake of emphasis. It is a tender thought that God may be moved to show forth His Loving-kindness by remembrance of the brief period within which a man's opportunity of beholding it is restricted, and by the consideration that so soon he will have to look on a grimmer sight, and "see death." The music again comes in with a melancholy cadence, emphasising the sadness which enwraps man's short life, if no gleams of God's loving-kindness fall on its fleeting days. The last three verses (vv. 49-51) urge yet another plea--that of the dishonour accruing to God from the continuance of Israel's disasters. A second "Remember" presents that plea, which is preceded by the wistful question "Where are Thy former loving-kindnesses?" The psalmist looks back on the glories of early days, and the retrospect is bitter and bewildering. That these were sworn to David in God's faithfulness staggers him, but he makes the fact a plea with God. Then in vv. 50, 51, he urges the insults and reproaches which enemies hurled against him and against "Thy servants," and therefore against God. Ver. 50 b is obscure. To "bear in the bosom" usually implies tender care, but here can only mean sympathetic participation. The psalmist again lets his own personality appear for a moment, while he identifies himself as a member of the nation with "Thy servants" and "Thine anointed." The last words of the clause are so obscure that there must apparently have been textual corruption. If the existing text is retained, the object of the verb I bear must be supplied from a, and this clause will run, "I bear in my bosom the reproach of all the many peoples." But the collocation of all and many is harsh, and the position of many is anomalous. An ingenious conjecture, adopted by Cheyne from Böttcher and Bickell, and accepted by Baethgen, reads for "all, many peoples," the shame of the peoples, which gives a good meaning, and may be received as at all events probable, and expressing the intent of the psalmist. Insolent conquerors and their armies triumph over the fallen Israel, and "reproach the footsteps" of the dethroned king or royal line--i.e., they pursue him with their taunts, wherever he goes. These reproaches cut deep into the singer's heart; but they glance off from the earthly objects and strike the majesty of Heaven. God's people cannot be flouted without His honour being touched. Therefore the prayer goes up, that the Lord would remember these jeers which mocked Him as well as His afflicted people, and would arise to action on behalf of His own Name. His Loving-kindness and Faithfulness, which the psalmist has magnified, and on which he rests his hopes, are darkened in the eyes of men and even of His own nation by the calamities, which give point to the rude gibes of the enemy. Therefore the closing petitions beseech God to think on these reproaches, and to bring into act once more His Loving-kindness, and to vindicate His Faithfulness, which He had sealed to David by His oath. Ver. 52 is no part of the original psalm, but is the closing doxology of Book III.